Students of a school in Gangtok have started collecting books for children affected by a landslide at Mantem village in North Sikkim. 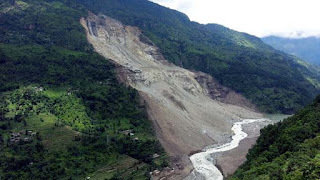 Sixteen students of the government primary school in Mantem are at present sheltered in a relief camp after their homes and a village school were destroyed in the August 13 slide. Thirteen villages in the upper Dzongu area with an estimated population of 5,000 people have been cut off after the only road link snapped because of the landslide. In Gangtok that is around 80km away from Mantem, students of Gen Next Academy, a private school at Tadong, decided to collect books for their friends whom they had never met. "I was surprised to get a request from the students seeking permission to collect new books for the slide victims. I was touched by their decision and allowed them to go ahead with the collection," said school principal Samuel Darnal. The school has 80 students.